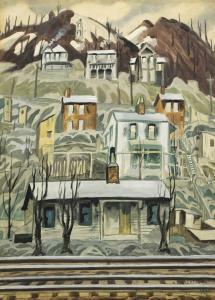 Find artworks, auction results, sale prices and pictures of Charles Ephraim Burchfield at auctions worldwide. 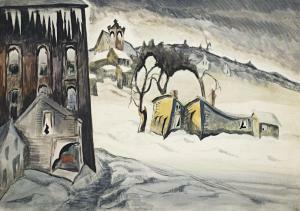 Charles Ephraim Burchfield (1893-1967) February Dusk signed and dated 'Chas Burchfield/1918' (lower left)--inscribed with title and dated again twice 'Feb. 15, 1918' (on the reverse) watercolor, gouache and pencil on paper laid down on board 15 x 21 in. 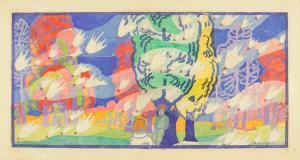 (38.1 x 53.3 cm.) Executed in 1918. Provenance Frank K.M. Rehn Gallery, New York. Dr. and Mrs. Theodore Leshner, Brooklyn, New York. Private collection, Connecticut. Christie\’s, New York, 25 May 1989, lot 336, sold by the above. Luise Ross Gallery, New York. 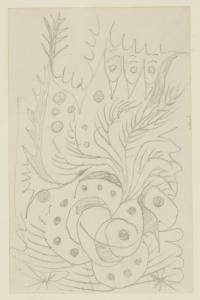 Bernard Goldberg Fine Arts, New York, acquired from the above, 1997. Christie\’s, New York, 20 May 2010, lot 94, sold by the above. Private collection, Pennsylvania, acquired from the above. [With]James Reinish & Associates, Inc., New York. Acquired by the late owner from the above, 2011. 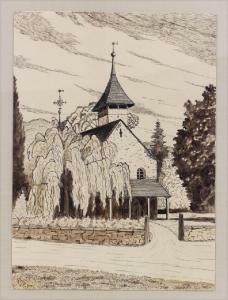 CHARLES EPHRAIM BURCHFIELD (American, 1893-1967) New England country church with weeping willow initialed and dated l.l. CEB 1957, watercolor, 20 by 15 in., matted, framed, under glass Directly from the private collection of the Straus family of Goldens Bridge, New York.Condition Absence of a condition statement does not imply the lot is in perfect condition, free from flaws, restoration, or the effects of aging. Condition requests can be obtained via email or telephone to our gallery. Any condition statement given either verbally or written is only an opinion and should not be treated as a statement of fact. CRN bears no responsibility for error or omission. All items are sold as is. All sales are final.